Since the beginning of history, people have sought remedies for the many ills that have beset them, from illnesses afflicting the body to threats posed by evil and hostile individuals. In many folk healing and pagan traditions, it was believed that one must gain the assistance of the guardian spirit of a healing plant or substance through prayers or offerings before its chemical properties would be effective. The Church decried these spells and practices as pagan superstition but did not seek to exterminate these beliefs, instead transferring the responsibility for their healing powers to the apostles and saints. Drawing on his extensive knowledge of ancient texts, Claude Lecouteux presents more than 600 magical prescriptions from both pagan and Christian sources from the last 2,000 years, covering everything from abscesses and shingles to curses and healing animals. He examines the practice of diagnosing illness through magic and looks at the origins of disease according to the evolving beliefs of magic practitioners over the centuries. He explores ancient beliefs about curses and about devils, demons, and ghosts and provides an in-depth look at protection magic, including protection of health, animals, and cultivated land, protection against curses, witchcraft, bad weather, and beasts, protection of a home, and protection while traveling. He includes spells from the heavily guarded gypsy tradition of magic and healing, drawn from newly discovered materials collected by two Romanian ethnologists who lived and traveled with gypsies in Transylvania in the mid-19th century. 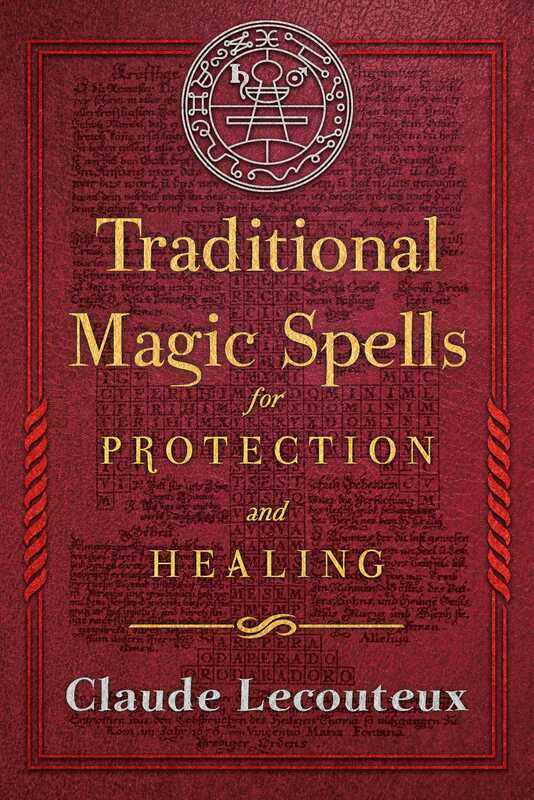 The author also reproduces rare texts on magic healing from the 14th and 15th centuries. Revealing the vitality of these practices in the remoter areas of Eastern Europe, Lecouteux shows how the influence of this pagan worldview is still detectable in the work of modern folk healers in France and Scandinavia. He also shows how the condemnation of unorthodox methods of healing has not vanished from the contemporary world: the medieval legislation against healing by wizards and bonesetters is echoed in modern health codes that challenge the authority of naturopaths and faith healers. Magical protection essentially assumes two forms in our accounts: prayer or amulet. Every time there is a recommendation to carry or wear something on your person, the mental process conforms with the etymology of the word “amulet,” which comes from the verb amoliri, “to ward off, to protect.” The object--plant, mineral, artifact--is a phylactery to which is attributed a preventive virtue against illnesses, afflictions, accidents, and evil spells. People seek protection--when starting a journey by land or sea and when staying at home--against anything that could possibly befall them. HDA, VII, 1611-16 (Reisesegen); E. Wickersheimer, “Figures médico-astrologiques des IXe, Xe et XIe siècles,” Janus 19 (1914), 157–77; Joan Evans, Magical Jewels of the Middle Ages and Renaissance Particularly in England, Oxford, 1922; C. Lecouteux, The High Magic of Talismans and Amulets, Rochester, Vt.: Inner Traditions, 2014. If you carry verbena on your person while traveling, you should have no fear of thieves as it sends them fleeing. Latin, fourth century, Pseudo Apuleius, Herbarius, cap. 73. I enter today upon the path taken by Our Lord Jesus Christ. May he be as gentle and good to me. May His pink and holy blood come aid me, and His five sacred wounds, so that I may never be captured or bound. May he guard me from all my enemies, may he protect me from drowning, swords, shot, and all manner of perils, bad company, and misadventure. May all bonds be removed from me, at once, as Our Lord Jesus Christ was liberated when he rose to heaven. Middle High German, fifteenth century, Grimm, III, 499. Repeat the following words. I shall go and travel among you1 with God’s love, Christ’s humility, the holiness of Our Blessed Lady, Abraham’s faith, Isaac’s justice, David’s virtue, Peter’s power, Paul’s steadfastness, God’s word, Gregory’s authority, Clement’s prayer, and the waves of the Jordan. f f p c g e g a q q est p t 1 k a b 2 a x t b a m g 2 4 2 1 qp x c g k q a 9 9 p o q q r.
The letters above are the initials of words that form a charm or orison, but we have not been able to pierce the secret. O one Father - O one Lord - And Jesus passed among them - pursuing his path - In the name of the Father - the Son - and the Holy Ghost - England, 1584, Scot, XII, 9, 233. May Jesus be my companion! Protect my blood and flesh. Amen. Transylvanian Saxons, Nineteenth century, Wlislocki, 1893, 112. Joseph of Arimathea found this bref on the wounds afflicted on the side of Jesus Christ, written by God’s finger when His body was taken down from the cross. Whoever carries it on their person will not die an evil death if he believes in Christ, and he will be immediately delivered from any awkward situation, fear, and danger. Fons - alpha & omega - figa - figalis - Sabbaoth - Emmanuel - Adonai - o - Neray - Elay - Ihe Rentone - Neger - Sahe - Pangeton - Commen - a - g - l - a - Mattheus - Marcus - Lucas - Iohannes - titulus triumphalis - Iesus Nazarenus rex Iudeorum - ecce dominicae cruces signum X fugite parte adversae, vicit leo de tribu Iuda, radix, David, alelujah, Kyrie eleeson, Christe eleeson, Pater Noster, ave maria, & ne nos, & veniat super nos salutare tuum: Oremus, and so forth. In addition to the names of God, such as Agla, and some unidentified words, what we have here is an extract of the Mass of the Invention and exaltation of the Holy Cross, otherwise used as an exorcism, notably in the Roman Breviary and the Feasts of the Spanish Saints. Folk tradition mentions the Orison of the Holy Cross used against the temptations of the devil. The prayers indicated here are the Our Father, the Angelic Salutation, the sixth request of the Pater Noster, and the Litany of the Saints, with a gap. It should read: Et veniat super nos misericordia tua Domine. Et salutarre tuum secundum eloquium tuum. England, 1584, Scot, XII, 9, 233 ff. The sixth pentacle of Jupiter is used for protection against all kinds of the dangers on land if one looks at it with devotion every day while repeating the verse that encircles it (Psalm 21: 17), you will never perish. The four names on the arms of the cross are Seraph, Cherub, Ariel, and Tharsis, the masters of the four elements. The True Minor Keys of King Solomon by Armandel, London: British Library, Lansdowne 1202 4to, 134.